Peters and Vaughn left us hanging as fog, vampires and the undead rise up in what was set to be a routine investigation. As trouble strikes they’re put out of the game and taken to a safe house in the middle of it all, the owner of which is a vampire conspiracy theorist researching a possible invasion scenario. Part 2 starts up without hesitation, the fog is thick and the crosses are all over with something lurking in the background, Vaughn is quiet but worried about Peters and we step into the mess from there. 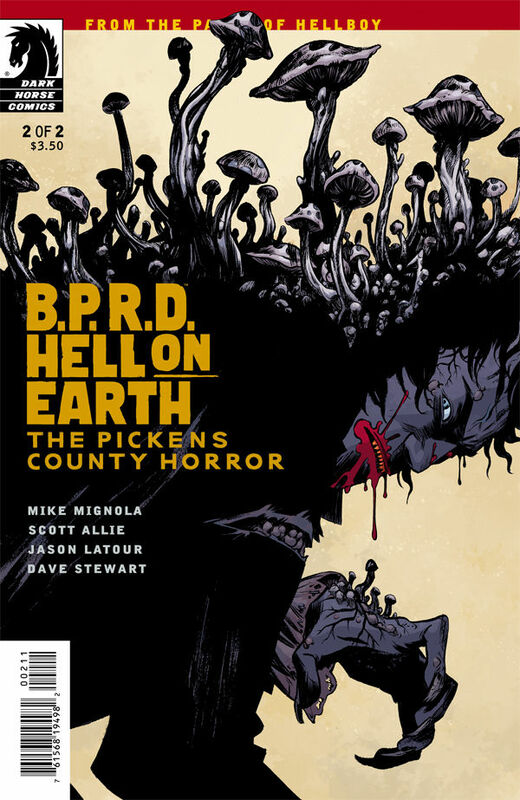 Pickens Country Horror is a relentless book, even with all the experience Vaughn has the story proves once again that he’s only seen a fraction of the horrors possible in the outbreaks so far. His confidence no matter how high is knocked down as the situation with the fog and the mushrooms grows worse, it’s a bad time to be an agent of the B.P.R.D. on this mission. Unfortunately as a mini series we’re whisked through the rest of the development including the history on the vampire group at work locally and their history. It’s not to say this has been a bad installment but the closure on it really shakes the foundation as a newer reader to the series, I can only hope this isn’t the end of this arc and that it spins into something more. One thing that Mike Mignola does without trouble is develop character attachment and #2 is where you really wish this wasn’t the case because of how much whiplash fills the pages of the story. If you’re a fan of B.P.R.D. this is a must have to your collection for the series, you have vampires, crazy supernatural fog and a crazy man telling you his end of the world conspiracy theory. If you’re a new reader, it might be a bit of rough ride to get into even if it does have a very interesting story, it just has a really rough closure that could throw off those new to the series even if the 2 issues are excellent reads. 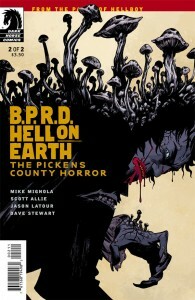 The art from Jason Latour is great, the expressions and body language don’t drop the experience while reading through it, even when going to supernatural levels the experience holds the reader in and even brings a bit of paranoia, with Dave Stewart assisting in color it’s really an immersion experience. Tillamook Country Smoker has formed a legend through the Northwest, providing jerky products of all varieties for consumers to savor and enjoy. Today we have two samples of that extensive line, the Silver Dollar Teriyaki beef jerky and the Teriyaki beef sticks. The container comes in a small tub, screw on cap with a 4 for $1 sticker on top, packed inside are 80 pieces of round cut jerky ready for the devouring once you break the air tight metal seal on top. The texture isn’t like many other varieties out there, smooth but not from a heavy grease or wax like film and the smell of the jerky is well pronounced. Taste does have a bit of a smoke to it with the sweetness and basic spices making up the teriyaki marinade, texture is tender allowing for easy bites and easy savoring without it breaking down. Those who prefer an easier to chew variety in controlled portions will no doubt enjoy this product as it tempts anyone to just consume the jar. At $11.51 it’s not a bad deal and if you have a bar or snack counter in your gaming area you can always recoup for your investment by taking their suggestion of 4 for $1 as it would allow for close to 2 jars after paid off. Personally it’s handy to have as opposed to sheets of jerky that can result in irregular sizes pulled by my hand or others that want a snack. You get a sense of what you’re consuming when you pull 4-5 pieces out vs ripping half a sheet. For those looking to budget their diets it’s a good alternative. Always a classic for anyone, from pepperoni sticks to Slim Jim’s the beef stick is one of the more common delights out there. Tillamook has their own take on the treat, attacking common areas like oily tastes, saltyness and a lack of flavor penetration. The 21 count jar of sticks in teriyaki form comes dry of excess oils and filled with a scent of goodness, on top of that, the sticks come in a separately sealed bag inside the jar. Taste is faint at first, the thicker casing adds a slight snap to each bite but soon you build the flavor up as you get past the ends of the stick. If compared to the silver dollar slices it’s not as prominent of a flavor but it’s still enjoyable, once you breach the casing the meat is tender and flavorful without much smoke to it, overall a satisfying snack to work on while writing this very section of the article. At 21 pieces it could very well carry one almost a month just in casual snacking each day. Wrapping up, it’s hard to knock Tillamook Country Smoker on the samples. The silver dollar pieces are downright addicting to have especially in this volume, the beef sticks are a solid alternative when your craving exceeds a few pieces of those dollars. One only has to wonder what else rests in store given that TCS also makes beef nuggets, sheets of beef in traditional form, sausage, jerky chew and more. Catch their site for the full choice of goods, unfortunately it’s a bit hard to find their stuff in-store, usually you can only keep an eye out at gas stations for the 3-4 space boxes of slab jerky or the tall tubes with beef sticks. Honestly I’ve never run across the Silver Dollar jerky in person until now but it’s very good especially if you just need a quick few for the road. Most of their prices are always on discount and there are many shipping options, I do suggest the slight upgrade for priority mail though if you want it fast or UPS ground if you want to cyber-stalk your order to your door. Also, if you have family or friends in active duty that you want to get hooked as well, check out their care package that ships over there. Tillamook Country Smoker seems to know no bounds for shipping around this world.